Thread: CoffeeSnobs FairCrack – The first project. 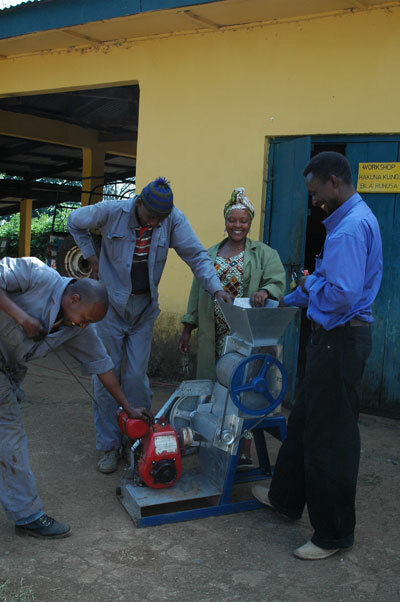 Its with great excitement I can announce that CoffeeSnobs FairCrack fund has just helped purchase some coffee processing equipment for the Kilimanjaro farming communities to use. The Machare estate was the first Utz Certified farm in Tanzania and it also has Rain Forrest Alliance (RFA) certification. *Not happy with just producing great coffee using good environmental and sustainable practices, Bente Luther-Medoch has coordinated and deployed small hydro-electric generators on the slopes of Kilimanjaro to provide power and proper irrigation for some of the villages. *It’s a great project and one that I thought we should help with so I enquired about it. Over the last month I have been communicating with Bente and she told me about the next local project that they hope to get off the ground. *In conjunction with the University of Agriculture and the local agricultural officers, Bente hopes to provide sustainability education and information to the small holder farmers and also install small communal use pulperies for their use. A coffee pulper would be installed in for each village and would be managed and maintained by the villagers themselves. *This would improve the quality of smallholder coffee considerably in the area by giving them direct access to processing equipment that they would be unlikely to install otherwise. Bente sourced two suitable pulping machines, one with a 600kg per hour throughput and a second larger one with 1200kg /hr capacity. *These will be installed in two villages on the Southern slopes of Mount Kilimanjaro and will allow the small holder farmers to take a far superior grade of coffee to market. (edit - the second pulper is going to go into Msuni. Below is the picture of one of the pulpers that Bente sent through today, I’ll update the thread with any information that we get and hope that we can continue to support projects like this that really make a difference on the ground in Tanzania. Well done CoffeeSnobs, your next Tanzanian coffee might have a certain special sweetness that only you can taste! Re: CoffeeSnobs FairCrack – The first project. That is very cool - well done all!!! Good one Andy. Absolutely brilliant. I couldnt think of a better use of the fund you created. Cant wait for the first batch of CS-sponsored Tanzanian Machare to hit Bean Bay. Will that be a possibility? Thats great, exciting news Andy. Thankyou for all your work behind the scenes to make this happen. Youve made a dream become a reality. I think the smile on Bente and the other peoples faces says it all! WOW! Thats so cool! Its really exciting to see! Brilliant news, Andy. Congratulations on your efforts (and, of course, the efforts of Bente et al). Its exiting to be involved in a small way with such a positive project in such a beautiful part of the world. Fantastic news! It is so good to hear that our Faircrack has gone to such a wonderful project! Cant wait to see more pictures! Well done on finding something so worthy. Its a fantastic effort on your part to bypass the dreaded "admin fees" monster. Yeah Brett, keeping the admin fee monster away certainly means more bang per buck. Im really excited about it too, it "feels right" and its a privilege to work with someone like Bente who is so dedicated to improving the lives of her neighbours while managing two coffee farms as a day job... she is inspiring. Bente isnt in the photo, I assume she is pressing the button on the camera. The gent on the right is Shayo, co manager at Machare Estate. As for beans... Ralph is also an exporter so there is a small chance that we might get some beans one day from both the Estates and the small holder farmers but that isnt the primary focus at the moment as I doubt we can get a big enough order together to make it viable... but never say never! Lending a financial hand on the ground is our main goal and if we can one day purchase product that will be a bonus! Congrats on making this happen Andy and for digging your heels in to make sure that every cent got to those who deserved it. I feel proud of my little part in such a worthy project, and to know that funds are going fairly direct to the recipients, rather than being diluted by middle-man agencies. It is always special to help those who cannot pay you back. I think its called "Self Less"
You da man alright !! Im feeling all warm and fuzzy after reading that. Well done Andy and everyone whos contributed. Fantastic to hear that as a community weve made a difference to the lives of so many people. And extra special thanks to Andy for proving that every last cent can make it to the people who need it most. Great effort Andy, I am sure this helping hand will be of great benefit to the communities on Kilamanjaro. Well done! Great to see the money go directly to the people who need it. Of course the real well done goes to all the cheerful members of our CoffeeSnobs community who never once complained about the additional fee on everything that we sell. It really is a case of lots of little (mostly unnoticed) bits adding up to something really substantial. Kudos to all that have supported our fairer trade FairCrack fund, I’m sure this is just the beginning of us really making a positive mark on coffee regions around the globe as we have a couple of other potential projects in the pipeline too. That is soooo cool. Great work Andy, and the zero admin fees are a great thing too. Nice work Andy. I totally concur that the amount we paid to FairCrack with the purchase never seemed very much, certainly not burdensome, but I guess it must have all added up after a while! Its great to see such a worthwhile result! Great stuff - happy to be a (small) contributor to this great result! Dont forget that if you are curious you can see your own contribution tally grow over time in the FairCrack tab of BeanBay. We have also linked this thread and will point to future project threads from there too. 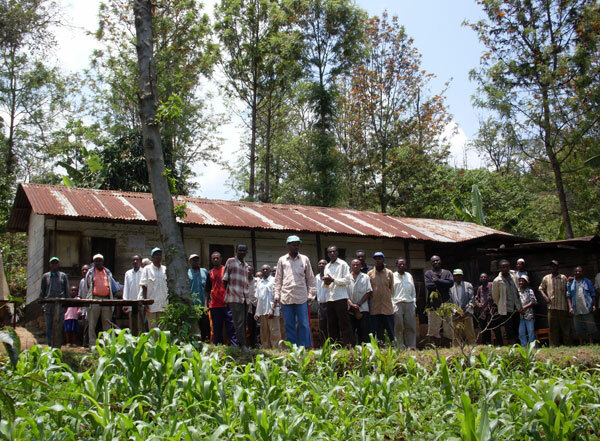 The farmers had their first meeting for the central pulpery yesterday in the village called Njari-Rononi. Below is a picture of the building that they have chosen to house the pulper and this week they will put together an action plan for how it should be run. Bente tells me "Everyone is exited and ready to start working on it." Should we send them a Coffee Snobs and/or Faircrack logo to put on their new machine. Perhaps print them on a sticky label?? I cant possibly think of a better use for the Fair Crack fund. Brilliant. Well done Andy!! Congrats on the support to the farmers. But this means the fund is depleted and so as a result we will have to buy more coffee [smiley=tekst-toppie.gif] I needed more motivation. Great Job Andy - and a great project too! - The money comes from our "loose change"
- AND we get to enjoy great beans at great prices! Sometimes things which may sound too good to be true can really be true ... thanks Andy for proving it. Knowing that Ive contributed (in a tiny way) to this wonderful act gives me a warm fuzzy feeling that makes me want to buy more coffee. Coincidentally, I read this thread while drinking a Tanzanian single origin (tanganyika), which makes the fuzziness warmer. Yeah, it IS good Oily. ...and we are all feeling the fuzz together. Another thumbs up from me, glad too see it in action. Andy this is absolutely brilliant, ive been wondering what would get funded. This is a practical and meaningful purchase and cudos to you for all of the work including the admin absorbtion. Makes me a very proud snob. Congratulations, Andy, on a simple (but brilliant) *idea expertly carried through. We may have provided our small Fair Crack contributions, but you conceived the idea, facilitated it on Bean Bay, found the needy niche and closed the circle. After an “all village” meeting, there are 68 small holding farmers that will be using this central pulpery in Njari-Rononi. Bente met with the owners of the building and managed to talk them into free rent for this season in return for fixing the perimeter fence and some small building repairs which sounds like a pretty good deal to me! Last year Bente installed a small hydro generator nearby and plans on diverting some of the output irrigation water to the pulpery so it will have running water which is rare for these villages that don’t have power or water on tap normally. In the meeting the farmers decided they are each going to bring their portable drying racks to loan to the project and leave it there for the harvest each season. That should provide enough communal drying area for the entire village to use. So all in all it looks like the lady dymano Bente is doing an amazing job of getting things moving on the ground and its all falling together. Longer term, there are 10 more villages like this in the area and I think CoffeeSnobs should aim to "rolling sponsor" pulpers until all the small holder coffee farmers in the Moshi / Kilimanjaro district have access to one. This project is providing tangible short and long term gains that will have a positive impact on many lives for years to come. Id be happy to see CoffeeSnobs keep working with pulpers in this area - I think there would be greater and more tangible benefits in doing little bits in a small area as opposed to little bits spread all over the world. I agree Viviane. It certainly doesnt discount doing "something else somewhere else" but I do think a focus on an area is good. Gods teeth Andy, way to go. Andy would it be possible for Coffeesnobs to get some green beans from the farmers or co-op at a cheaper price say$6.00 a kilo. We buy it from beanbay at say $9.00 a kilo and that money could go into Faircrack Fund. Or would this be a bit of a nightmare to do. How many 20 tonne containers will we buy? Whos US$100,000 per container is going to pay for it up front? Freight, customs, AQIS and sheer volume makes this too hard to do. At some point in the future we might be able to get some beans but it would be a piggy-back on a 20 or 40 tonne order from someone else. Just be happy we are helping for now. Ok Andy I can see how this is much more involved than I first thought. I think you are doing a cracking job, by the way. i think its fantastic work Andy and this site is doing, its really showing a model of charity and co-operation that other companies could apply. Its great to see such a worthwhile contribution so well executed!